Kingdom Rush: Vengeance is a game developed and published by Ironhide Game Studio. The basic principle of this game is Tower Defence. But the interesting twist here is that you are not playing with the “humans”. You are in command of the Orc Horde and you must annihilate the humans. The Kingdom Rush: Vengeance release is something that refreshed the sequel. There are three games made by Ironhide Game Studio. All of them have the same title: Kingdom Rush, Kingdom Rush: Frontiers and Kingdom Rish: Origins. And all of them was a lookalike. The new game is even more fun and with more humor. The basic plot in the game is that at last, the Orc Horde will try to conquer the humans and this time you are in charge of the battles. And I am not going to lie that this is something rare – to play as the bad guy, but it is definitely very fun and amusing. The strategies that you will use are the key to your victory or defeat. We all were very excited when we saw the first Kingdom Rush: Vengeance trailer. Now the game is here, and we can enjoy the “RUSH” once again. 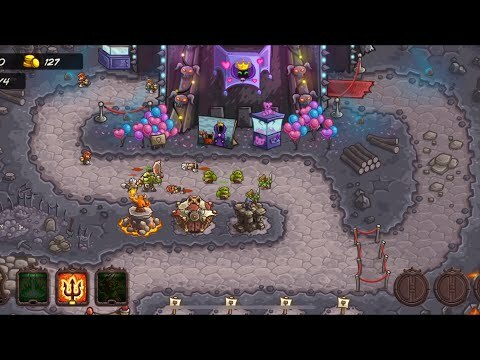 And now, let`s talk about the gameplay of Kingdom Rush: Vengeance. I will be honest with you. This is the part of the game she really shines. The game has all the basics for a Tower Defence game and keeps them that way. The twists are coming from the great cartoonish style of the graphics, and the humor that you hear while you are plying it. The strategy aspect of Kingdom Rush: Vengeance is focused on the tower placement and their upgrades. Trough the different maps you must place towers in the most suitable place depending on their class and effect. There are the standard archer towers, a mage tower and a barracks tower which plays the role of a slow tower. Each tower costs a different amount of gold that you receive after killing an enemy. If you manage to kill the whole wave you will get a bonus gold. Each type of enemy is dropping a different amount of gold, again depending on their class. Kingdom Rush: Vengeance heroes system is one of the ways to enhance your defenses. When you gather enough energy, you will be able to deploy a hero. Each hero has different skills and effect on the enemy waves. But they can be upgraded to do more damage and will assist your towers. The upgrade system of Kingdom Rush: Vengeance towers and heroes is essential when you are progressing through the levels. With each level the enemies are becoming stronger and you need to properly manage your upgrades if you want to clear the map. The game is a little one-sided, but that is understandable since this is a pure Tower Defence game. All I can say about this game is this: It is fun, and I think that you have to try it!